Mitchell Wilensky was born and raised in Queens. He is a product of the New York City public school system and a graduate of Bayside High School in Queens. He attended Cornell University receiving a Bachelor of Arts in Economics and received his Juris Doctor degree from the State University of New York at Buffalo School of Law. After law school Mr. Wilensky began his legal career as an associate attorney in the estate department of one of the largest law firms on Long Island, and within a few years became the head of the department. In 1987 he started his own practice concentrating in New York Estate, Probate and Inheritance law. Over the years he has successfully handled countless uncontested and contested New York probate, estate, trust and inheritance cases for clients who live not only in the New York City metropolitan area but across the country. He has been involved in leading cases, including a landmark case in the New York County Surrogate's Court regarding the right to a jury trial in a proceeding to invalidate a lifetime trust, as well as a litigated Kings County (Brooklyn) administration case in an estate of a victim of the September 11th terrorist attacks. Mr. Wilensky has lectured other attorneys and the general public on estate administration & planning, estate litigation and estate tax issues. He has also been quoted in the New York Times and Newsday. 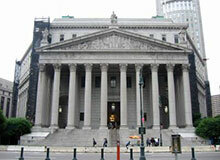 In the past he has been frequently appointed a Guardian ad Litem by a number Judges of New York’s Surrogate’s Courts. From 2002 to 2011 he was an active Certified Financial Planner practitioner. He is an active member of the New York State and Suffolk County Bar Associations and has served as president of a condominium association, cooperative apartment corporation, and a property owners association. Kinship Cases – Establishing Heirship. Frequently appointed Guardian ad Litem for persons under disability by New York Surrogate's Court Judges in probate, accounting, guardianship and wrongful death proceedings. CERTIFIED FINANCIAL PLANNER – 2002 to 2011 – Certified Financial Planner Board of Standards, Inc.